It's a big day for top White House economic advisor Gary Cohn. No, not because the tax bill is about to pass the House (again) and soon be signed into law by President Trump. Instead, it's because he had his first-ever appearance at an Axios live event. 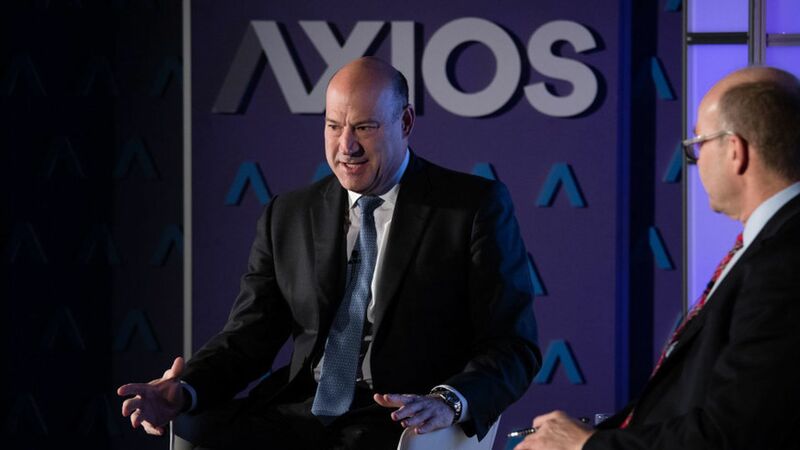 Cohn said that if he could change one thing in the tax bill, it would be to have closed the carried interest loophole. He believes it is fundamentally unfair, and adds that President Trump agrees with him. "We probably tried 25 times... The President asked just this past Monday if we could still get rid of it." History: Cohn said the Bush tax cuts were followed by other countries also lowering their rates, thus reducing their effectiveness. "This would be a failure if we don't capitalize on our competitive opportunity and let the rest of the world catch up to us." Infrastructure comes next, and Cohn insists that the federal government has the required $200 billion. He will not support an infrastructure bank. • New fund alert: Word is that Section 32, the venture firm formed last year by ex-Google Ventures boss Bill Maris, is back in market with its second fund. $175 million target and a $250 million cap. Maris declined comment, natch. • Personnel scoop: Natalie Bruss, former VP of digital strategy for Hollywood PR powerhouse ID, has joined real estate-focused VC firm Fifth Wall Ventures as a partner, Axios has learned. This may at first appear to be an odd hire for Fifth Wall, but partner Brad Greiwe tells Kia that Bruss has the exact expertise that large real estate incumbents need as their industry evolves to focus more on experiences and services. For example, office space is no longer long-term leases for empty buildings—it's WeWork's hip month-to-month co-working model and The Wing's exclusive space for women (neither of which are Fifth Wall investments). Juul Labs, a San Francisco-based maker of vaping devices, has secured $112 million of what could become a $150 million convertible note offering, per an SEC filing. Why it's the BFD: Because this is the company that recently hired Kevin Burns to be its CEO, following a spinout from original parent company Pax Labs. If Burns' name sounds familiar, that's because he is a former top partner at TPG Capital who left to help turn around yogurt-maker Chobani as COO. Plus, I see tons of people using these things, particularly when I venture into the more college-centric parts of town. 🚑 Rowsley Ltd. (Singapore: A50) has agreed to acquire Thomson Medical, a provider of healthcare services for women and children in Singapore, from Peter Lim for US$1.18 billion.